I've been an amateur (ham) radio operator for decades, My call is K8ZRH and there was a time when I was obsessed with the hobby, so caught up in making contacts with every state in the nation, every country in the world, that I stayed up all hours of the night tracking DX (distant) stations, Eventually, to keep peace in my marriage, I backed off and, for the past ten years or so, have been pretty much inactive. Anyway, my foray back into amateur radio came about after volunteering for the communications team that is part of my county's Department of Homeland Security. My all electric, solar powered Roadtrek eTrek is a perfect vehicle to use in times of emergency and now, with the radio, I'm able to provide emergency communications with my own power supply when called up. But I will also be able to have use of the radio as we travel the county. The wife's condition I had to agree to in installing the radio was that it had to be neat. No wires and ugly installation. No holes in anything. The photos show the results. I'm pretty happy. And it meet's Jennifer's approval. The rig is a dual-bander (144/440MHz) Kenwood TM-V71A, I chose that rig because I generally like Kenwood two-way radios from my past experiences and this unit in particular has a detachable control head. I had to pick up an extension cable but I was able to locate the radio itself in an out of the way place hidden from view on a storage shelf above the driver's seat. The control head, with the connecting cable hidden behind the trim, was Velcr o-ed on a perfect spot just below and to the right of the steering wheel. I made no holes in the dash. The industrial strength Velcro I used can hold 10 pounds. I doubt the control head weighs more than 8 ounces. The radio itself is also Velcro-ed in place on the shelf so it doesn't slide around. The power connection is direct to one of the eTrek's eight AGM batteries, accessed through an access panel located under-the-carpeting in the cab part of the van. The were were duct taped in place as they ran across the floor. For an antenna I again had to choose neatness. The non metal body of the Roadtrek makes getting a ground or using a traditional magnetic mount difficult. So I selected the Larsen KG-2/70-CX-PL on glass antenna. Again, I snaked the antenna wire behind the trim to a place where it could reach the top right window on the second row passenger's seat. The antenna, on a sticky pad, adheres to the outside of the glass while a coupler on the inside sticks to the glass exactly opposite for a very adequate inductive connection. By the way, I've found that using a putty knife is a very simple way to gently pust wires and cable behing trim coverings. 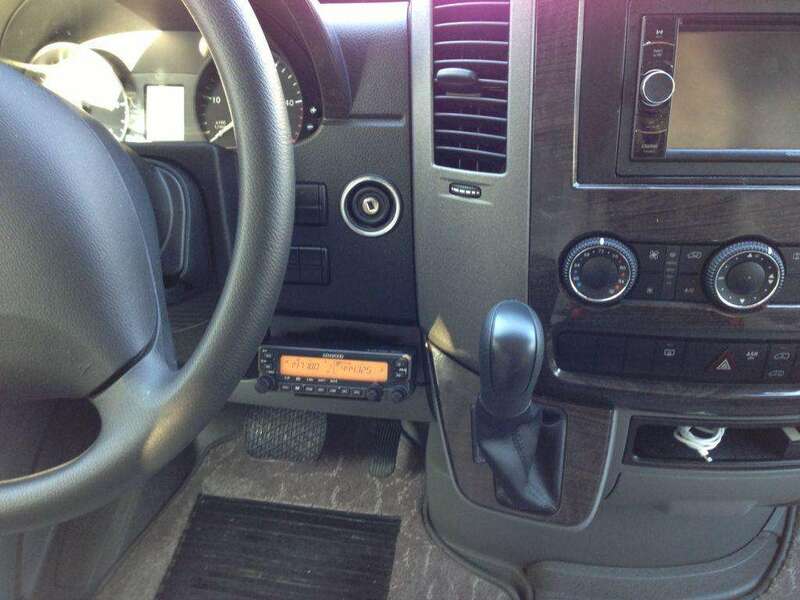 Use plastic ties under the dash to keep any wires from dangling down or showing themselves. I get a solid SWR (hams will know what this means) of about 1.6 to 1.9 to one across most of the bands, more than acceptable. All of the local repeaters are full-quieting, meaning I'm receiving and transmitting well. So there you go. I'm now K8ZRH mobile. My first add-on mod for my new eTrek. CQ CQ CQ… do you still say that? I was a ham for many years but sadly let my license expire. Reading your article has me checking those links. Now that I’m retired, it would be a great time to get involved in a hobby I have very fine memories about. It is never too late to get back in the hobby!!! I retired in 2001 and just then started studying for my ticket. Next month it will be the Extra exam. Lots of new stuff for you to play with but the old is still good. I’ll see you on the radio. Hi , I read your article. I am inactive in ham radio for right now. I have a camper trailer. Can’t wait to go camping again. I will put 2 meter rig in it. I used to be VQ9WB on Diego Garcia. I was there twice but only operated there the first year tour. They didn’t allow us to operate when I was there in 1987. I was VERY active in 1980/81. Safe driving to you and yours out there.PS: I was a truck driver for 18 years after retiring from Navy. am retired again now on SS. I am 65 . bye and 73 to you. what is the process for getting a ham license. What can you expect to invest into it. Depends which country you are in – but this is global – even allowed in some countries that you might not expect ordinary folk to use radios to communicate globally. Generally in the US, UK or most other countries it is just a case taking 3 levels of technical exam. You can take this exam with support of a radio club – worth a search to see if there is a club nearby to yourself – most are friendly and helpful and will accelerate your understanding a lot. This gets you ‘on air’ able to transmit and talk to others on the radio – although it’s a good idea to a listen to others talking for a while to see what goes on. The entry level level licence limits you on what you can do or how powerful your transmitter can be. You can learn to get the best out of what you have – it will give you a taste to improve and learn more, hopefully. you might be happy with that – but you can take the next exam or even the advanced level exam – this gives you full permission to use transmitters from the around the AM band through short wave – VHF and beyond up to amazingy high microwave frequencies. Don;t wory about that – really its about pushing yourself and learning more. It’s an interest/technology that is over a hundred years old – so the hobby is matured – and wide ranging – when you find your niche it might be very different to someone elses interest. How do you attach your Positive and Negative wires to the battery? Do you have to put a longer bolt on the battery for the wires? Put a round connector on both and there was plenty of room on the terminal with the other connections. The link bellow will take you to a video project we did in 2010. My wife and I attended Quartzfest this year. We spent 5 days in the desert with about 500 other Hams. The entire event was 10 days long, and we arrived late and left early. There were many good seminars, a Ham Swapmeet, many many interesting radio installations in their R.V.. If you have a self contained travel vehicle, this is a fun event. There is no cost to camp, and no entry fee. Sometimes though, you get what you pay for. The only thing provided is a spot in the dirt to park.